Box trucks are used by renters to move boxes, furniture and oversized appliances from one location to another. The cubed storage space of a box truck is ideal for stacking and arranging packages neatly for safe hauling. 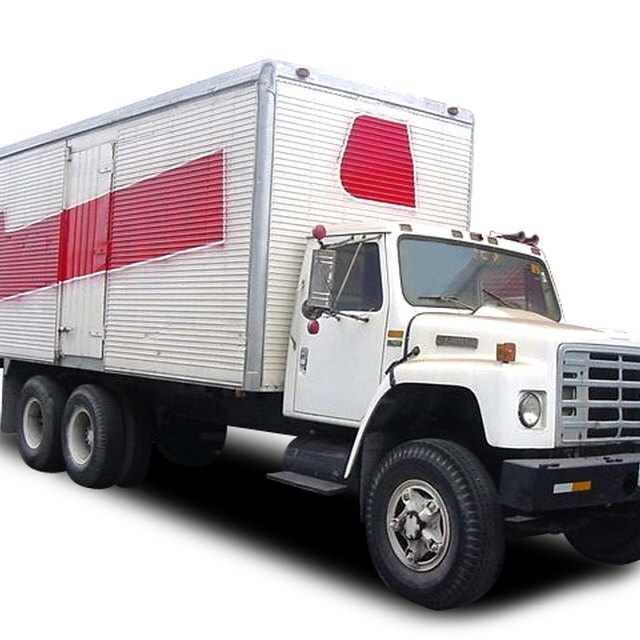 The biggest names in the box truck business are rental companies such as Ryder, Enterprise, U-Haul and Mayflower who rent their trucks to individuals and corporations. You must understand the nuances of the box trucking industry including pricing, insurance coverage and maintenance before starting your business. Refine your box truck company's business plan with detailed analysis of competing businesses and budget projections. Devote an entire section of your plan to the pricing, vehicle selection and moving products offered by competitors to contrast with company. Calculate your start-up costs for trucks, liability insurance and advertising as well as available funding to create a one-year balance sheet. Apply for a commercial loan from a local bank to start your box truck business on sound financial footing. Approach your loan officer with a business plan, an ideal loan amount and personal financial information to smooth the loan application process. After your loan application is processed, seek investments from local businesses to bridge the gap between the loan and your initial expenses. Seek truck and general liability insurance from Western Truck Insurance Services Inc. to cover your box truck fleet. Truck liability insurance is coverage for medical and legal costs if your box trucks are involved in accidents during rental. General liability insurance is vital for box truck businesses because it protects the company from financial damages due to renter negligence. Negotiate monthly payments for a fleet of box trucks from truck sellers such as Jukonski Truck Sales. Mix lightly used and new box trucks to keep your overhead costs low. Inspect used vehicles for current mileage, engine performance and condition of the cockpit to invest your money in the best trucks possible. Fill your box truck office with tape rolls, furniture mats, hand trucks and other moving supplies before opening your business. Place these products on wall displays with a price list available on each wall to help consumers make informed decisions. Purchase your moving supplies from wholesalers such as U.S. Box Company; add a modest markup to earn a small profit. Limit your office staff to a handful of part-time counter clerks and a mechanic in your company's first year. Your counter clerks should be capable of handling reservations, reviewing truck inventories and answering rental questions. A mechanic experienced in handling wide-ranging problems such as broken door latches, engine troubles and body work can help keep your trucks looking good. Print hundreds of rental forms for customers to complete before renting your box trucks. Your rental form should lay out clearly the per-mile rate, requirements for fuel levels upon return and sample charges for damage done to box trucks. Require renters to put down credit cards with these forms to protect your business from stolen and excessively damaged trucks. Create an inventory form for your box trucks that will be used by counter clerks to check box trucks in and out. The inventory form should feature a silhouette of a truck where pre-existing damage can be marked before a box truck is rented. Include details about hand truck and furniture pad use to charge customers in case of damage. Promote your box truck business using truck wraps and targeted advertising before renting your first truck. Each truck wrap should feature daily rental rates, your office location and available truck sizes to inform prospective customers. Post advertisements at college campuses, apartment buildings and condos to maximize the impact of your initial marketing blitz. Cultivate side businesses from your box truck company to generate additional revenue. Estimate the building and maintenance costs of running a storage facility on your property compared to monthly rental rates. Your box truck company can expand into moving product sales, used truck sales and other activities that enhance your bottom line. Open additional locations for your box truck business to increase convenience for prospective renters. Your satellite locations can be small offices with a handful of truck spots to store rented trucks from your central location. If your business stays in one location for years, you will not be able to capitalize on higher rental rates for one-way trips ending at a satellite location.